Dr. Murnaghan studied at Queen’s University in Kingston, Ontario where he completed his undergraduate and medical degrees. His orthopaedic residency was completed at The University of British Columbia. During that time he participated in a one-year elective in medical education and concurrently obtained his Masters of Adult Education. His fellowship training continued in Vancouver, with a fellowship in Arthroscopy and Athletic Injuries. His paediatric fellowship training included six months at Royal Children’s Hospital in Melbourne, Australia and a one-year fellowship at Texas Scottish Rite Hospital for Children in Dallas, Texas. Dr. Murnaghan’s main area of clinical interest is the orthopaedic care of athletic injuries in the paediatric, adolescent and collegiate athlete. His clinical practice in Toronto includes general pediatric orthopaedics with a sub-specialty interest in paediatric athletic injuries and the use of arthroscopy in the management of a wide spectrum of pathologies. His practice extends to the adolescent and collegiate athlete with close association with the MacIntosh Clinic at The University of Toronto and his young adult practice at Women’s College Hospital. 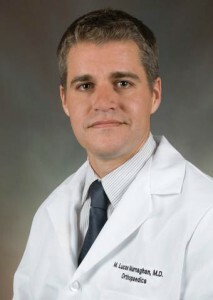 Dr. Murnaghan is devoted to education at the medical student, resident and fellowship level.